If you are searching for a professional makeup artist or hair stylist for your wedding day in the Sydney region, June-Rose is your premier choice. June-Rose works with her clients to create beautiful makeup looks perfectly suited to each individual. The combination of skill, experience & high quality makeup products is the secret to June-Rose’s bridal makeup looks of distinction. June works with each of her clients to suit their needs, style & skin type to create beautiful looks that not only photograph brilliantly but lat throughout the day and night. June uses the latest and best beauty products, including those from Giorgio Armarni, Nars & Mac. No matter what hairstyle you wish for your wedding day, June-Rose can create the look of your dreams. From elegant updos or a classic down do, June’s hairstyles last for your entire wedding day or night. With over 30 years of experience, June-Rose can work with all hair types & lengths. 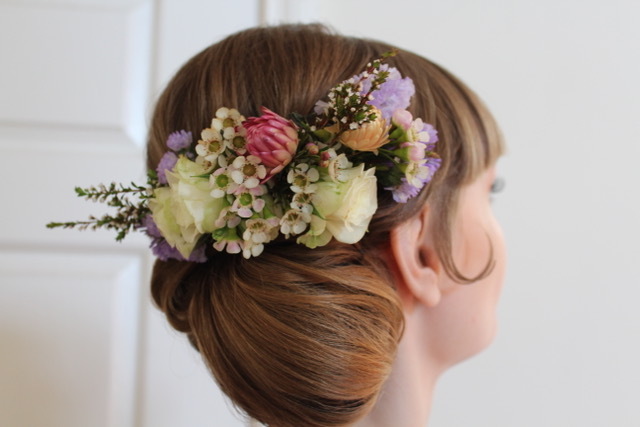 For more information about our Sydney bridal hair styling services, click here. To book your hair styling appointment, contact June-Rose today! I look after my brides on their wedding day, creating perfect makeup and hair. Prior to that important day, I help advise, support and am totally professional. I make a difference to a bride’s wedding day, with an unparalleled MOBILE service every time. Fill out our online form to make a booking enquiry.